Parts which are driven by belts. 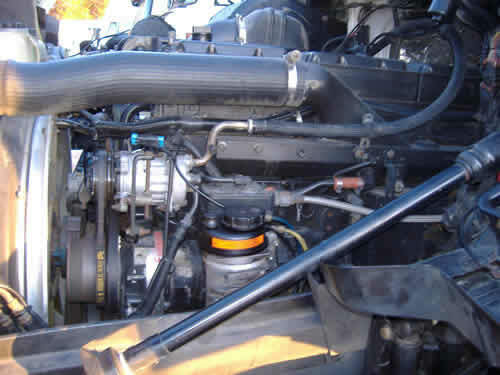 a) Alternator - I am checking the alternator for missing, damaged, or broken parts; and that it is securely mounted. b) Water Pump - I am checking the water pump for leaks and any missing, damaged, or broken parts; and that it is securely mounted. That completes the Engine Section, continue to the next section (Cab to Trailer). Wiring - I am checking the wiring for broken, loose, or frayed wires which could cause an electrical fire. Steering Box - I am checking the steering box for any missing, damaged, or broken parts; and that it is securely mounted. 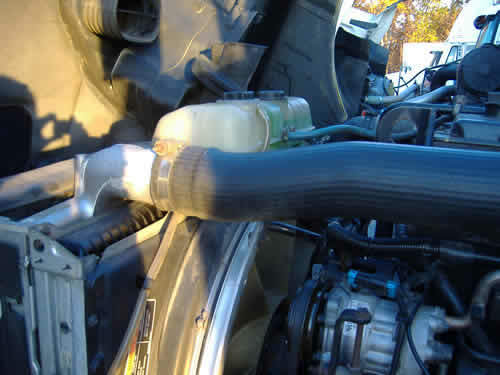 I am checking the power steering hoses for leaks or damage. 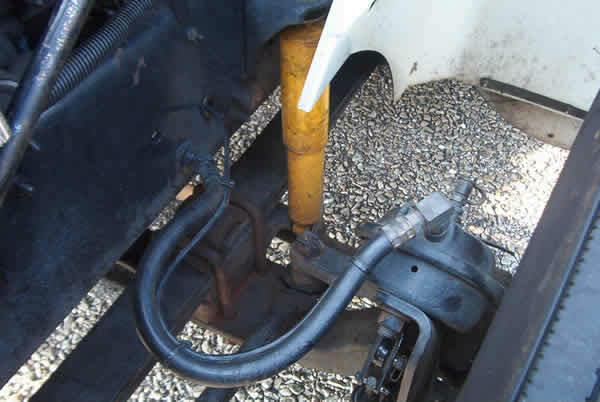 Steering Linkage - I am checking all connecting links, arms and rods from the steering box to the wheels for worn, cracked, bent, or damaged parts. I am checking joints and sockets for worn, loose, or missing parts. I am checking that the cotter keys are present. Suspension - I am checking the spring mounts for cracked or broken spring hangers,missing or damaged bushings,broken or missing bolts,u-bolts or other axle mounting parts.I am checking at each point where they are secured to the frame and axle.If leaf springs,I am checking for missing, shifted, cracked or broken leaves.If coil springs,I am checking for broken or distorted coil springs.If equipped with torsion bars or torque arms,I am checking to see that the torsion bars and/or torque arms are securely mounted and are not damaged.If air ride suspension,I am checking for damage or leaks. d) Air compressor - I am checking the air compressor for any missing, damaged, or broken parts; and that it is securely mounted. If the compressor is gear driven, advise the examiner. Radiator hoses - I am checking the upper and lower radiator hoses for cracks, wear, leaks and that they are not rubbing any other parts. 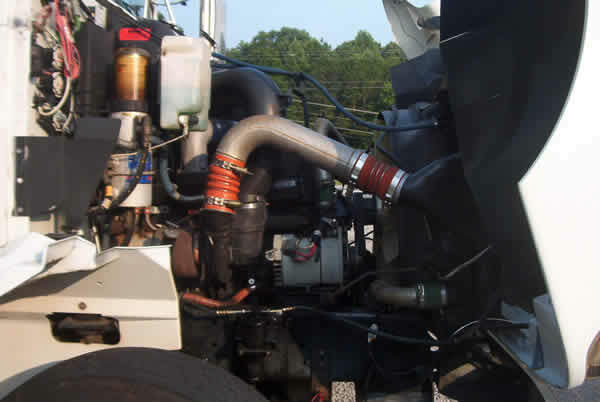 Heater Hoses - I am checking the heater hoses for cracks, wear, leaks and that they are not rubbing any other parts. Slack adjusters - With the wheels chocked and brakes released I am checking that the slack adjuster does not move more than 1 inch when pulled. If greater than 1 inch, the brakes will apply unevenly and should be adjusted. I am checking for any missing, damaged, or broken parts. The angle between the pushrod and adjuster arm should be slightly over 90 degrees with the brakes released and slightly less than 90 degrees with the brakes applied. Brake shoes and linings - I am checking for grease or oil on the linings, if they are worn, and if there are any missing, damaged, or broken parts. Brake Drum - I am checking the left side steering axle brake drum for cracks, dents, or holes. If the brake drum has a crack 1/2 the width of the friction area it will put the truck out of service until replaced. Wheels - I am checking the left wheel on the steering axle to see if it is bent, damaged, or cracked. I am checking for any welds which are not factory. These are not allowed and would put the truck out of service if found. I am checking the lug nuts for missing nuts and tightness. Rust around the nut may indicate they may be loose. Nuts should be checked with a lug wrench. Hub or Axle Seal - I am checking the hub seal for leaks (axle seals on drive axles, hub seals on all others). I am checking level of oil (if seal is transparent). Shock Absorber - I am checking that the shock absorber is securely mounted, the bushings are good and it is not bent, leaking, or damaged. 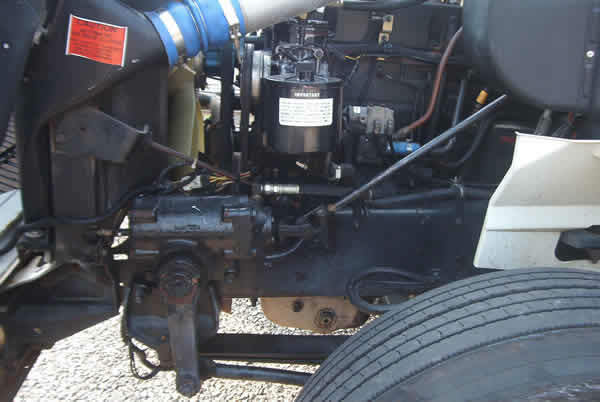 Hose - I am checking the hose and couplings to the left brake chamber on the steering axle for any cracks, wear or leaks. 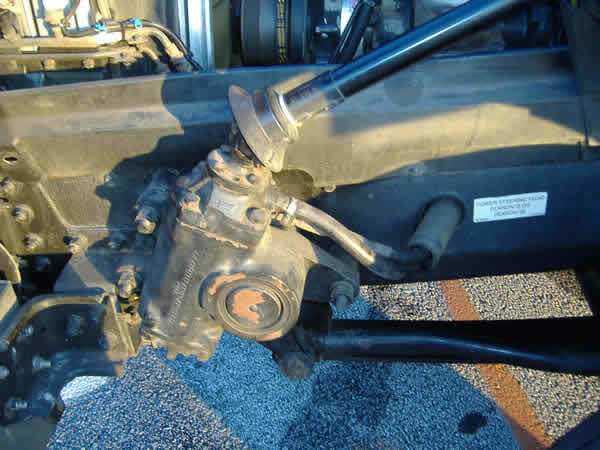 Brake Chamber - I am checking the left brake chamber on the steering axle for air leaks, cracks, and missing, damaged, or broken parts; and that it is securely mounted.